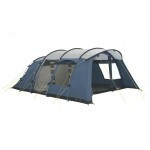 The Vango Samara is a new tunnel tent for 2011 and is recommended for families who need plenty of living space to house tables and chairs, spacious sleeping compartments and plenty of head height throughout. The Samara 400 features an immense 370x310cm living area (take your harem) and a single 4-berth inner tent with roll-back inner divider. 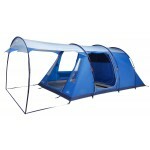 There's a large front 'U' shaped step-in doorway with double mesh door and a side 'D'- shaped step-in doorway with mesh double door and fixed canopy on the outside. 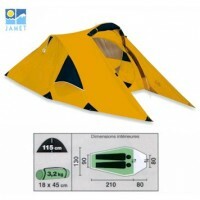 The tent has a sewn-in groundsheet throughout and Vango's Tension Band System (TBS), adjustable internal webbing straps you can use to strengthen the tent in gusty weather conditions. 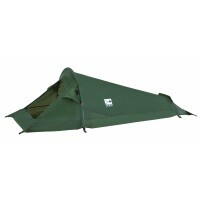 Key features of the Samara includes, a fully sewn-in polyethylene groundsheet with 10,000mm HH protection, external pole sleeves and pole clips allowing flysheet first erection, fully seam-sealed Protex 4000 durable polyester flysheet for 4000mm hydrostatic head protection, PowerFlex fibreglass poles, breathable 190T polyester inner tents with part mesh doors, darkened 'lights out' inners, 'Crystal Clear' windows with internal curtains, inner storage pockets, zipped cable entry point, handled carry bag, repair kit. Fire retardant materials used throughout. 10-20 minutes pitch time. 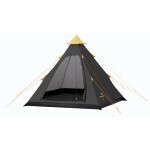 Vango Samara 400 Tunnel Tent - 2011 Model.